“I date the boys, and I date them in fun and novel ways,” Scott told me. Last week, Scott received a copyright strike from the small indie Japanese developer who designed his channel’s visual novel du jour, which called into question the nature of his work: Is it harmful to the games he loves? 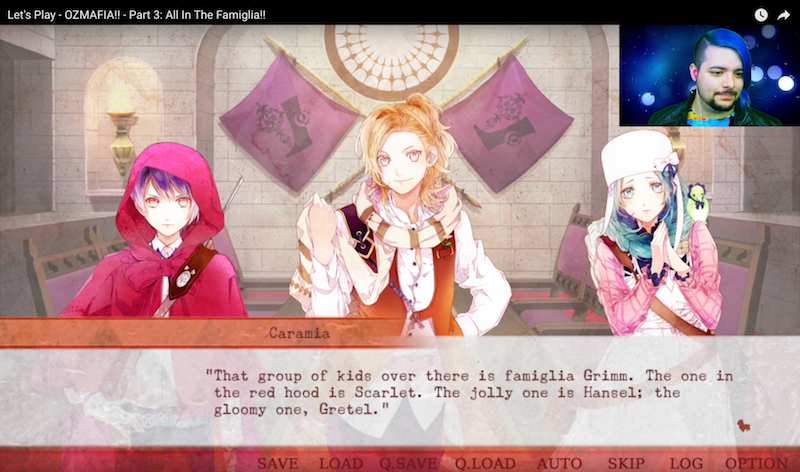 After Scott posted his 15th Let’s Play of OZMAFIA! !, a Wizard of Oz-inspired dating sim that publisher MangaGamer sells for $35.00, developer Poni-Pachet sent a copyright strike to his YouTube channel. It’s YouTube’s way of protecting IP-holders against copyright infringement. Recipients must take down the offending YouTube video. If a YouTuber receives three strikes, YouTube removes their channel, deletes their videos and forbids the user from creating another account. Visual novels are non-linear stories in which players make narrative choices that affect the outcome of the plot. Because of that, visual novel Let’s Plays don’t have the same moral or legal status as, say, Overwatch Let’s Plays. The real pull of these games is their story rather than their mechanics, so developers and publishers may worry that potential buyers will simply watch the game instead of purchasing it. Knowing what happens could remove viewers’ incentive to play themselves. Let’s Players interviewed, however, believe what they do falls under fair use. Scott and others explain that their videos “transform” developers’ IP, referring to a legal term for work that “add[s] something new, with a further purpose or different character, and do not substitute for the original use of the work.” By “transforming” the intellectual property through Let’s Play commentary and editing, YouTubers argue the work is more theirs, and that it can even unwittingly boost sales for the original IP. To some, developers’ own wishes for streaming and uploading videos comes secondary. According to Poni-Pachet, Scott “infringed” on their rights. As a small, all-female, Japanese indie developer, they are protective of their intellectual property. Their publicly-available note on streaming clarifies they only permit gameplay video recording “within the scope of the trial version,” adding that “Broadcasting any part of the full version of the game or revealing any parts of the game story is not permitted.” Per the boundaries of this statement, it is within their rights to request deletion. In a tweet—Poni-Pachet’s only direct method of communicating with Scott—the developer said they’d continue taking down his OZMAFIA!! videos as long as they were getting posted. Scott argued in his defense that the videos had been planned and scheduled for months. YouTube had automatically published them. He also implied that he didn’t know about their policy, which is surprising, since he has been studying Let’s Plays for five years. Solon Scott told me he understands that developers don’t want the ends of their games spoiled. But he doesn’t agree with it philosophically. Scott believes that, by posting several OZMAFIA!! Let’s Plays—videos in which he’s breathing his own personality into the work—he’s contributing to the visual novel fan community. It’s publicity, even if inadvertently. Small publishers like Poni-Pachet don’t have the resources to do this on their own, so he’s lending them a hand. This is where Scott has a leg to stand on, from a legal perspective. In his videos, Scott teaches viewers literary devices like “in media[s] res.” He acts out characters’ voices with moving charisma. He explains plot points and generic themes like a high school English teacher. It’s a heightened visual novel experience, unlike the experience of playing the game on your own. Scott isn’t off-base: Popular visual novel Let’s Player Joey “The Anime Man” Bizinger actually receives copies of visual novels from publishers who want publicity. Publishers collaborate with Bizinger to boost their game, but he always pays attention to what publishers’ policies are on uploading to YouTube. Giving “enough space for viewers to experience the whole game for themselves” is, in his estimation, “a smart and understandable business move,” he told me over e-mail. What makes Bizinger’s videos “transformative,” as per fair use requirements, is the commentary he gives throughout gameplay, jokes, voice-acting, facecam reactions and edits that, he says, “push the jokes and punchlines across.” He believes this is what makes his videos exempt from copyright. The Sekai Project, which translates and publishes visual novels for international audiences has actually sent Bizinger visual novels for his YouTube channel. They reason that, because visual novels have a variety of choices that branch into separate endings, and not all YouTubers will play through every route, visual novels are rarely completely spoiled. Also, visual novels that aren’t voiced benefit from YouTubers voicing over them. The YouTuber Dodger, they said, posted a valuable dub of every character in Fault MileStone One. Scott is still heartbroken to see developers bite the hand that, in his view, could feed them. In any case, most of his viewers, he thinks, have already played the visual novels he’s posting. They just want to see what other routes are out there. OZMAFIA!! is dynamic in this way, providing players several routes for maximal replayability. “A Let’s Play is in no way a substitution for the experience of playing a game,” Scott said.